Year 12 Business Studies students enjoyed a visit of the Hyundai head office and distribution operations recently. On their tour, they were given a taste of what it would be like to work for a global company. Students were also encouraged to apply for a development scholarship under the Pinnacle Programme, which Hyundai supports. This is a unique scholarship for talented young New Zealanders which enables them to participate in two of New Zealand's iconic leadership programmes - Spirit of Adventure and Outward Bound - as well as in high-performance workshops and work with a mentor. 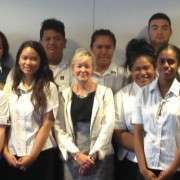 Former Manurewa High School student Sandy Kimpton, who is chief financial officer for Hyundai's New Zealand distribution company, helped to coordinate the visit. She said it was a privilege to have the opportunity to share her experiences with fellow students. She encouraged them to explore the possibilities “out there” and the doors that could open with an open mind and a determination to grow every day. "Thank you to Manurewa High School for their support and encouragement to this generation and finding a way give them experiences and exposure to areas they may otherwise not encounter."